The new version of KooZic (v0.4.0) is officially out! Six months after the release of the very first version, a big step forward has been achieved with a new folder browsing view. This should satisfy people who don’t have a library correctly tagged. KooZic was created with ID3 tags in mind. It is still the strength of the software since it gives you access to tracks, albums, artists or genres effortlessly, whether other softwares provide limited capabilities. 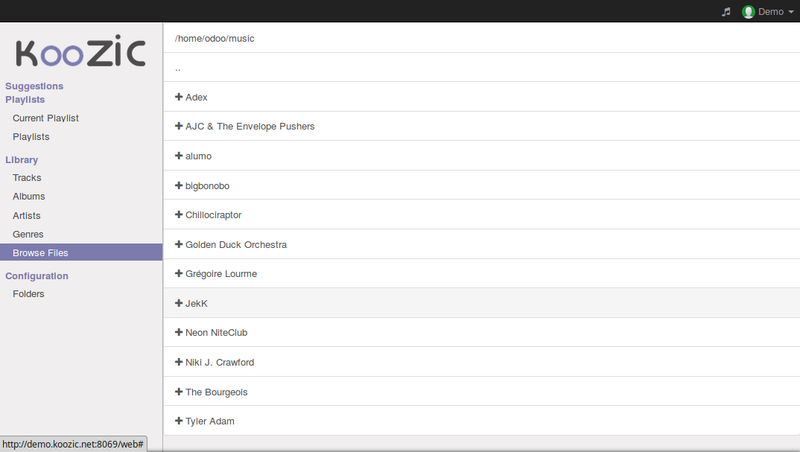 However, if spending hours to tag your music collection is not your cup of tea, KooZic is not really usable. A folder browsing mode was introduced back in v0.2.0, but it was not handy. The new browsing mode follows the same foundations that the software: a clear and easy access to the essential functionalities, whatever the size of the library. The first element of the list is the current folder. The second (‘..’) allows to come back to the parent folder. Then, the list of sub-folders and the list of tracks. 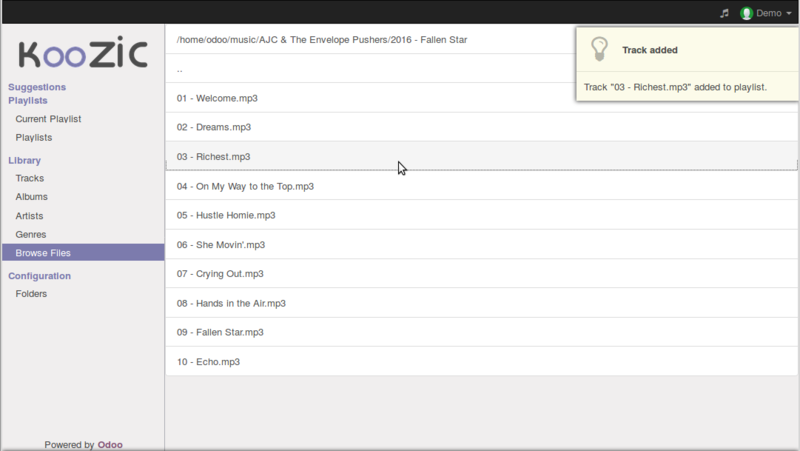 It is possible to add to the current playlist all tracks of a folder by clicking on ‘+’. A track is added with a simple click. The interaction with the current playlist has been improved. A click on a track launches the playback, and using the button ‘Play’, which has disappeared. The track highlighted is updated automatically at every track change, not only when the whole page is refreshed. That is clearly a minor enhancement, but that globally improves the user friendliness. When the upgrade process is over, start again your server and enjoy!